The aroma of charred pink meat still sizzling on my plate set my taste buds tingling with anticipation. My daughter and I were surrounded by chattering Argentinians in a cosy steak restaurant called Chiqillin, reputedly a short walk from our boutique hotel – Rooney’s – in Buenos Aires. We were relieved: we’d spent thirty minutes looking for this place after being given the wrong directions by the hotel receptionist. The poor girl was mortified when she realised her mistake. It was our first night in this exciting city, and it had taken us nearly twenty four hours of flying to get there. We collapsed with grateful sighs into soft, fragrant bedding in the tastefully discreet Belle Epoque decor of our room, and awoke next morning well rested and ready to set about our first day of exploration. 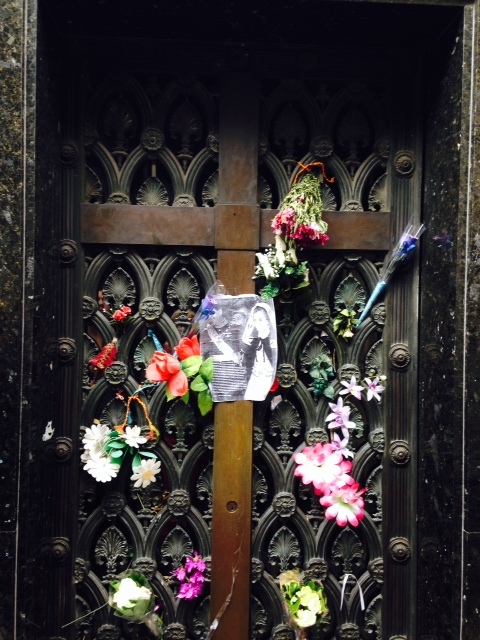 Beneath gentle drizzle we walked to the fascinating Recoleta cemetery to locate Eva Peron’s tomb, where a small crowd was gathered. An ostentatious affair it was, but by far not the most elaborate in this typically Latin cemetery like a small village of crypts, mausoleums, chapels and statuary. 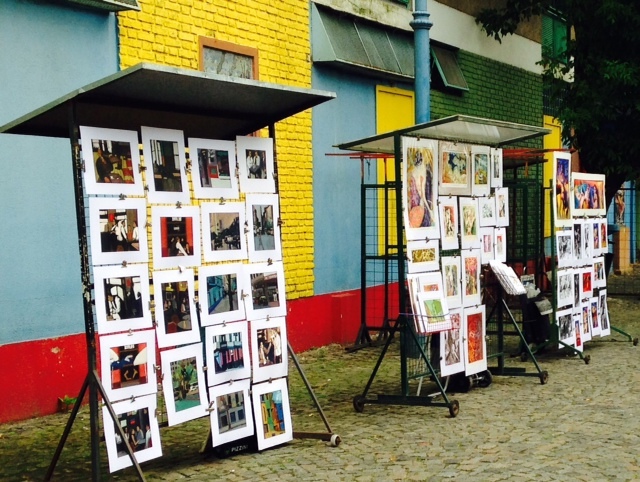 A city tour took us to the grand buildings and parks, and we alighted at La Boca, famous for its outdoor art, on sale in cobbled streets lined with pastel coloured dwellings. In the evening we took in a Tango show at El Querendi, inadvertently holding our breath at the passion of the dances. Lithe, muscular men and slim, sinuous women snaked around each other’s bodies with haughty heads held high, only to clip their heels together, simultaneously jerking their heads in the opposite direction, and glide smoothly across the floor with lust shining in their eyes. Phew, pass me a fan! By next morning the drizzle had turned to steady rain, so we figured a day trip to Colonia in Uruguay was in order. Who knew, it might not be raining there. It wasn’t; it was deluging. After disembarking the ferry we peered out of the terminal building; there was no way we could walk outside unless we were willing to wade through calf-high floods, which we weren’t. So there was nothing for it but to take shelter in a restaurant. Only there weren’t any, as far as we could see. Which was about three metres in any direction. A gloomy looking individual hurried past, head down. ‘Por favor! Señor! Hay algun restaurante por aqui?’ He pointed up the road ahead, nodding, but said nothing. We plodded slowly until we saw a weak glow emanating from an empty looking cafe. Aha, food. Fast food. We were of course, not in any hurry. After all, we had five hours to kill. We tried to enjoy our burger and chips. We really did. There was no wine to be had, but we made do with water. And then came the piece de resistance: pudding. I have never seen such an enormous dessert. 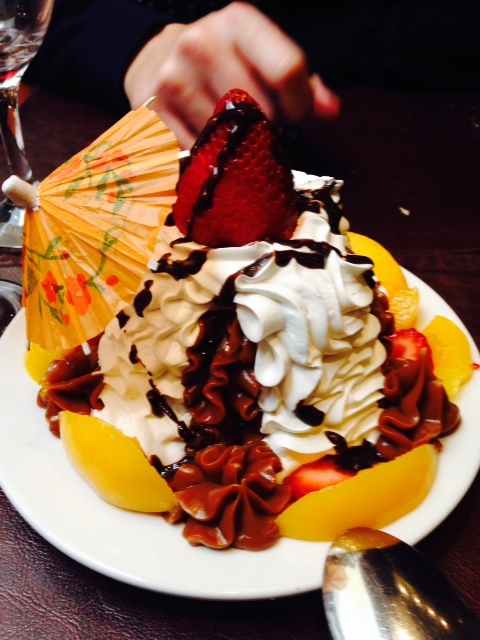 Whipped cream, tinned peaches, and chocolate sauce on a sponge base, topped with a huge strawberry and a cocktail parasol. Yuk. But we tucked in, there being nothing better to do. At last, the sun came out just as we were setting out to get back to the ferry. We caught a glimpse of some of Colonia’s unevenly cobbled lanes and dilapidated, lichen-covered houses. The place had a quiet charm, and I could imagine that in different weather, it would be a fascinating town to get lost in. A further few days of eating, drinking and excursions, and we found ourselves sitting in the vibey crowded outdoor bar Negroni in a street in Palermo. We’d started off with a gin and tonic served with cucumber. A fishbowl full, that is, not a glass. After which we’d stumbled across the road to Las Cabras Parillada restaurant for a veritable feast of meat. Steak, of course, plus chicken, sausages and pork, and a basket full of chips. The platter measured 40cms by 20cms, and was piled to a height of 10cms. That’s a lot of meat. We managed just over half. Washed down with the ubiquitous and essential Malbec red wine…mmm. We couldn’t possibly go back to the hotel, needed time to digest all that meat, so made the clear-headed decision to go back to the Negroni, where we stayed until 5.00a.m. before reluctantly hailing a taxi to Rooney’s to pass out for a fw hours before the long haul flight to London. Viva Argentina!